Description: This office renovation comprises base building alterations to an existing 1,300,000 sf building (the former Verizon Building), and tenant fit-out work. 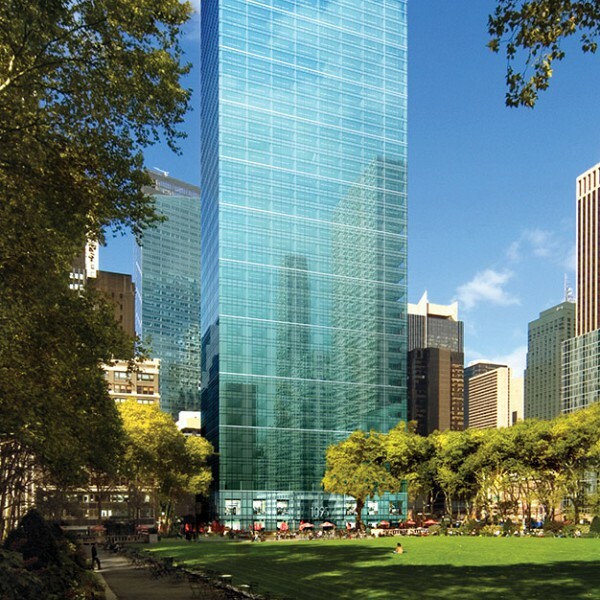 Infrastructure upgrades for the 41-story building include a new central chilled water plant, two hybrid drive 2,700-ton centrifugal chillers, one 1,500-ton electric centrifugal chiller, a 600-ton electric chiller, a central station VAV air handling system that serves the high-rise and tower floors, and a floor-by-floor VAV air handling system that services the low-and mid-rise floors. Floors 3-5 and 13-20 are served by new dedicated floor-by-floor air handling units with a waterside economizer, while heating is provided by low-pressure steam, with perimeter heating provided by overhead heating coils in perimeter fan-powered boxes. Two new 2,700KW turbine-powered emergency generators supplied by a 19,000-gallon fuel oil tank provide emergency power.